Sing. Hum. Rap. Strum. Capture your musical ideas—anytime, anywhere. Take is the creative vocal recorder. 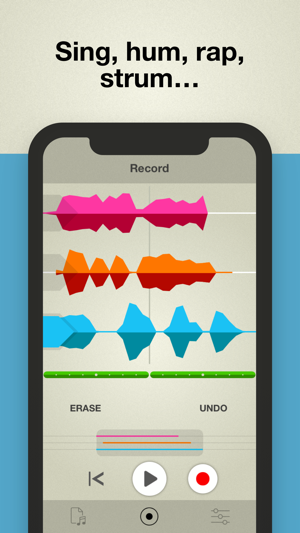 With a single tap you’ll be recording, beatboxing, overdubbing, riffing, writing and sketching out song ideas. • Kickstart your creativity with inspiring built-in loops and beats. • Sound like a superstar on your phone’s built-in mic. • Feel the groove. Stay on the beat. Keep in time. • Add new parts. Double them up. Create harmonies. • Build your tune and flesh out your ideas with three tracks. • Polish your tracks with built-in effects, mastering and more. • Subtly tune your voice to stay in key or go full-on robot voice with Voice Tune. • Open an audio file and add your own voice to become the star. • Share your recordings to social, email, AirDrop and other apps. Take combines drop-dead simplicity with features that are custom-tailored for vocalists. 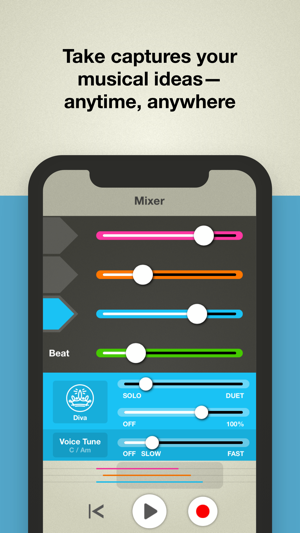 Record harmonies along with your voice, blend in effects to sweeten the sound and sing along to an array of beats and rhythms. Take is the ultimate voice memo sketchpad for capturing your musical ideas. Note: Take is optimized for the built-in microphone on your iOS device. To eliminate feedback and hollow-sounding tracks, wearing headphones is recommended while recording. Best results come from using headphones without an integrated microphone, and recording directly into your iPhone/iPod/iPad. It’s a relatively quick and easy tool to use for fast ideas past a basic voice memo recording app. It quickly makes you wish there were more tracks available though. You can’t get fully fledged demos out without degrading/redownloading your full masters. 1. There should be between 4-16 tracks available. Even for an app aimed at simplicity. 2. If you have too many takes in one recording, it will not let you record anymore. I don’t know if this is a bug. 3. If there are more available time signatures other than 4/4, I have not found a way to access them. Discoverability is not great in this app. 4. The erase function is cumbersome. 5. Trimming a song during mastering is not precise. 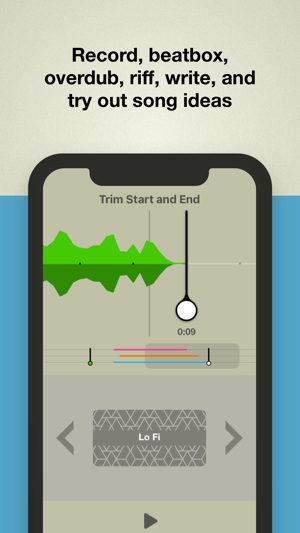 Not everyone uses this app simply for vocal harmonies, you know. Think about it: Vox, Guitar, Drums, Bass. 4 tracks. Replace Drums with Keyboard if you’re just using the beats in the app. Having 4 tracks would greatly improve usability. I keep uploading songs to Allihoopa to “pick up” just to add more tracks to my own creations. It is a silly, time consuming process, and there’s no indication as to how much processing and degradation the song goes through when it’s uploaded.